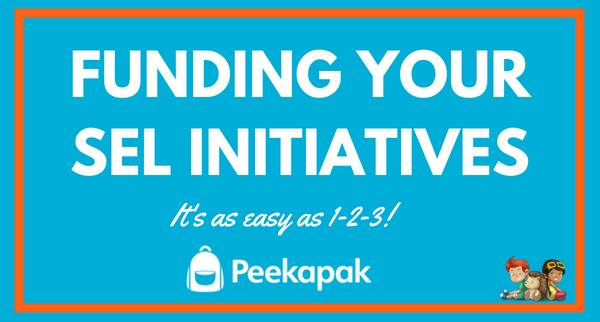 At Peekapak, we know district and school budgets are tight and finding the funds to meet demands throughout the school year can be difficult, especially when it comes to funding social-emotional learning (SEL) programs. There are many options to fund your SEL initiatives. A reminder that this list is not exhaustive and if you need assistance with learning how to fund your SEL initiatives you can always reach out to us at hello@peekapak.com. If your school qualifies, you might be able to use Title funding or other federal funding programs to fund your SEL initiatives. For example, Title IV Part A funding is used for providing students with a well-rounded education, supporting safe and healthy students, and supporting the effective use of technology. Technology-based social-emotional learning programs, such as Peekapak, provide resources for students to have a more well-rounded education, offer ways for schools to promote the mental health and well-being of students and implement technology in a way that is innovative and effective. For more information on Title IV Part A click here. Another federal funding option is Skills for Success. Skills for Success supports students’ non-cognitive skills development, such as growth mindset and experiential learning opportunities. This grant is given in order to increase overall student success by implementing, evaluating, and refining tools that integrate the advancement of these skills into classroom lessons. A number of SEL programs, including Peekapak, are partnered with PledgeCents. PledgeCents is a crowdfunding site that helps teachers fund the cost of implementing various educational programs. They are a completely free to use platform designed to improve education and community needs. Over $1.5 Million has been raised to date by fundraisers on PledgeCents. Click here for more information on PledgeCents. There are many privately offered grants available for K-12 teachers. One example is the McCarthey Dressman Education Foundation’s Teacher Development Grants. The Teacher Development Grants are for teachers who are looking to make use of innovative classroom instruction tools and initiatives such as Peekapak. They offer grants worth up to $10,000 per year for a maximum of $30,000 over three years. Applications are accepted every year between January 15th to April 15th. We hope you found these tips helpful. If you are a school leader and want one-on-one assistance in funding your social-emotional program, book a time with us today! Looking for a technology-based platform to teach empathy and other social-emotional skills for elementary aged children? Look no further than Peekapak. Peekapak is an award-winning, social & emotional learning (SEL) platform that leverages engaging lessons, stories and digital games in the classroom and the home. Developed by education experts, Peekapak’s innovative curriculum teaching skills like gratitude, empathy, and self-regulation within literacy, reading, and writing based learning curriculum.